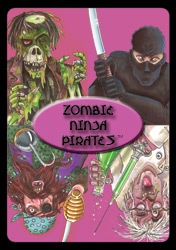 Zombie Ninja PiratesTM is a quick 20-30 minute card game for 2-6 players ages 13 and up. In Zombie Ninja PiratesTM players try to become four different types of peopleâ€š â€” Zombies, Ninjas, Pirates, and Mad Scientists. During the game they can collect objects to help them or hurt their opponents. Strategy is important, since players are limited on what they can do each turn. At the end of the game, a fast-paced lightning round can make or break the winner.